Place the dried cherries and Chateau Ste. Michelle Merlot in a small saucepan. Bring to a boil and then reduce the heat and simmer, stirring occasionally until the liquid is almost gone. Remove from the heat and cool. Coarse chop the cherries and place in a small bowl. Add the chopped red onion, vinegar, honey, and cumin. Mix well, then add salt and pepper to taste. Adjust the sweetness depending on how tart the cherries are. Add the chopped fresh herbs and mix well. Set aside until ready to use. May be made up to a week in advance, but add the herbs just before using. Place the mayonnaise, adobo sauce, and lime juice in a small bowl and whisk together. Season with salt and pepper to taste. Heat a medium sauté pan over medium high heat. Add enough oil to cover the bottom to ½” deep. Heat the oil and then add a few tortillas at a time. Fry each turning once until lightly browned on both sides. Remove from the pan and put on a paper towel lined pan. Cool and then store in a sealed container for up to 1 week. Place the tostadas on a baking sheet. Put ½ tsp of chipotle aioli on each. 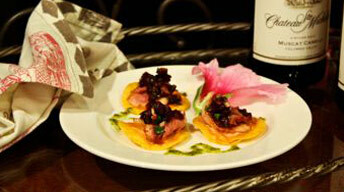 Top with about ¼ oz of the smoked duck, and ½ tsp of the cherry salsa. Sprinkle with chopped parsley to garnish.